AhnaldT101, congrats buddy, you’re finally going to get your wish. After a rumor on Discord that appeared to be a leak about the Road Ahead for Star Wars Galaxy of Heroes surfaced earlier this week, we now know some of the future of SWGoH. CG Carrie’s Road Ahead post went live tonight just before 6 pm ET and was highlighted by an upcoming General Grievous rework and a complete Droid faction rework. 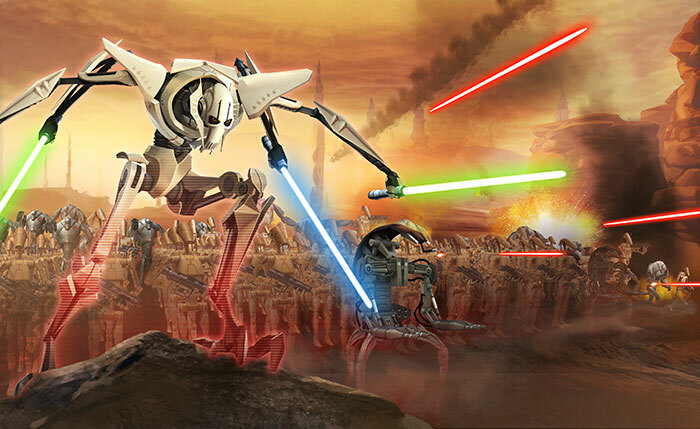 Alongside the rework of the IG-100 Magnaguard, B2 Battle Droid and more will be the additions of the B1 Battle Droid and the Droideka which appear to fit well under a reworked General Grievous lead. But the Droids will not be the only new content as the Emperor’s Command Shuttle is set to be added in the coming months as well. In addition, more Quality of Life updates are set to be tested in the BETA program for SWGoH. For the entire Road Ahead posted on January 31, 2019, click here to go to the EA SWGoH forums. Be the first to comment on "SWGoH: Grievous Rework, Emperor’s Command Shuttle highlight the Road Ahead post from Capital Games"